What's worse, that as explained by her in her video, this was a guided process that preferred outcomes which matched a pre-set concept of how the image should look. 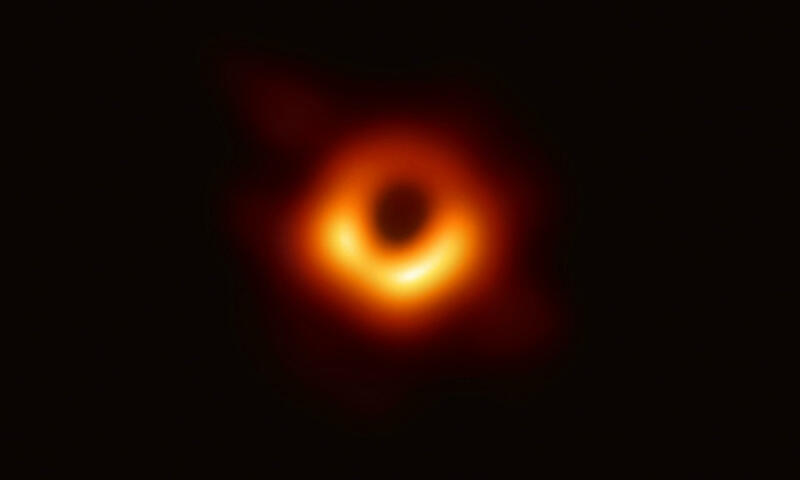 Which in turn means, that the black hole might not look at all like in this image, and the image was only generated this way from all the noisy data because of the built in bias in the process. So, when we'll be able to take better images of for ex. a black hole that's closer to us, it might turn out that black holes don't look at all like in this picture. NightAntilli, JaredTheDragon, mosu and 1 other person like this. This just fascinates me how technology has become so advanced quickly, remembering my childhood 20 gigabytes were considered a lot and look at the stage were at now. Time sure is flying by..
Let the msm tell it and apparently Katie Bouman did it all by herself. takemaru, JaredTheDragon, Gmachine and 3 others like this. Carljames and p51d007 like this. I want to know if they backed up the data before shipping it. It's not quite as abstract as you are leading us to believe... the "pre-set" concept of what a Black Hole should look like is based on tons of previously gained data... this isn't just a bunch of grade-schoolers shooting in the dark. Charles Olson, mbrowne5061, Burty117 and 2 others like this. Am I the only one who thinks the image is a little underwhelming...? JaredTheDragon, Carljames, dms96960 and 2 others like this. They didn't. The amount was so large and the cost of duplicate drives beyond the budget. What they got they flew around the world and hope it got there safely. The BBC did a fantastic hour long show on this entire endeavor and it aired the day the picture was revealed. It was pretty fantastic, a great deal of the hardware are was shown off. 'How to see a black hole: The universe's greatest mystery.' Available on BBC iPlayer. Try a VPN or some such if you outside the UK. Charles Olson, jobeard, wiyosaya and 3 others like this. The armchair scientists here at TS totally know better than the scientists who do the actual work. It's, like, way more accurate to come up with a superficial opinion in 30 seconds than spend a decade or more of your life generating, planning, and executing experiments. Charles Olson, mbrowne5061, Cal Jeffrey and 1 other person like this. Cal Jeffrey and ShagnWagn like this. I am aroused, that black hole does it for me. And I'm beginning to understand what managed to move Einstein in his elderly years. But they didn't take a picture of the black hole in our galaxy, they took a picture of the one in M87. This article isn't credible in any sense of the word. mbrowne5061 and JaredTheDragon like this. What does the black hole in our galaxy have to do with this article? All that data for this shi**y photo? What a waste of $$$$. It looks like some new kind of a scientist's fake. The presentation seems done in a kidden garden. Why are we wasting money studying something that will simply kill us if it/we get close enough. it's like an ant studying a wind tunnel thats on with millions of spinning blades inside. entirely pointless and a waste of time.....wtf. cure something. Charles Olson, mbrowne5061, Agnomen and 2 others like this. In my early computer days, 20-megabytes was considered a lot. takemaru and Charles Olson like this. Charles Olson, Lew Zealand, robb213 and 1 other person like this. Those were some of the most ignorant comments, surprised that such people would be on a tech website. Extreme lack of curiosity or understanding of why others would like it. And even the typical, "Why can't these astronomers cure something?" Basically people who think that these things are done fore likes on social media. Just the way they were able to get such a close up shot by essentially creating a huge radio telescope using the rotation of the Earth to fill in the different spots was really amazing. The reason it looks blurry is because it really is just a zoomed in dot inside of what would be a regular size pictere. That's how far away it is. Charles Olson, mbrowne5061 and wiyosaya like this. Well, I guess Nokia is heading in the right direction for once. It's not quite as abstract as you are leading us to believe..
Me leading you to believe? But it wasn't, but she explaining the bias process. I just made a logical conclusion based on what she said. So, IF what she says is correct, then what I'm saying is ALSO correct. Which if used as a bias, will ensure that we can only get results that mostly confirm the already existing data - even if reality is different. That's the actual point I made. It's a far more complicated process - and it's almost certainly a very accurate image. That smear blob? I mean, if it would be a really crisp and detailed image, then chances would be lower that all of it was only a result of the bias. But this smear is not definitive by any means. With all the bias added to the filtering process, you could generate this smear even from totally random noise. Which is essentially what they supposedly did - except the data wasn't totally, just partially random noise, which however overwhelmed the actual data. That's the reason why the biased filtering was needed. Now, IF the bias was correct, the image still could be "correct". But if the bias was incorrect this is most likely a totally false image. Or at least contain the same possible inaccuracies as the original data used to bias the filtering algorithm. ... and there's a human need to explore. I really think that those who knock this sort of thing are those who have been conditioned to accept a very limited and pedestrian set of possibilities for their lives, and thus reject the limitless possibilities that imagination and exploration offer. And my point, had you bothered to read, was that the bias IS almost certainly correct.... this "bias" comes from decades of observation and research from fairly intelligent scientists... what makes you think it's wrong?!!? And while the software takes this "previous bias" as PART of rendering this image, it was by no means the only way. Those 8 giant telescopes still had plenty of "real" data that reinforced the image - without any bias. Again, before you shoot down something that tons of brilliant people spent years and millions of dollars on, perhaps think that just MAYBE, they might know a bit more than you do?